This salad just speaks “fall” – featuring homemade croutons made from our Cranberry Wild Rice Bread and a festive Cranberry Orange Vinaigrette. It’s striking in its bright cranberry red color, but also extremely flavorful. We used apple cider vinegar and dijon mustard for that traditional tangy vinaigrette flavor. Agave sweetens things up (you could also use maple syrup in its place). Add a little fresh orange juice, a splash of olive oil and a pinch of salt and pepper to taste. 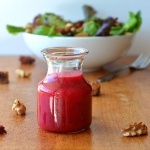 A blender or food processor works to chop the cooked cranberries and at the same time, emulsify the vinaigrette. It’s sweet, has that slight tang to it and tastes amazing when served with our salad of mixed greens, toasted walnuts, dried cranberries and…our Cranberry Wild Rice Bread croutons. Just cut the bread into cubes, toss with 1 tsp of oil in a saute pan on medium-high heat until crispy and toasted. Soooo goood! 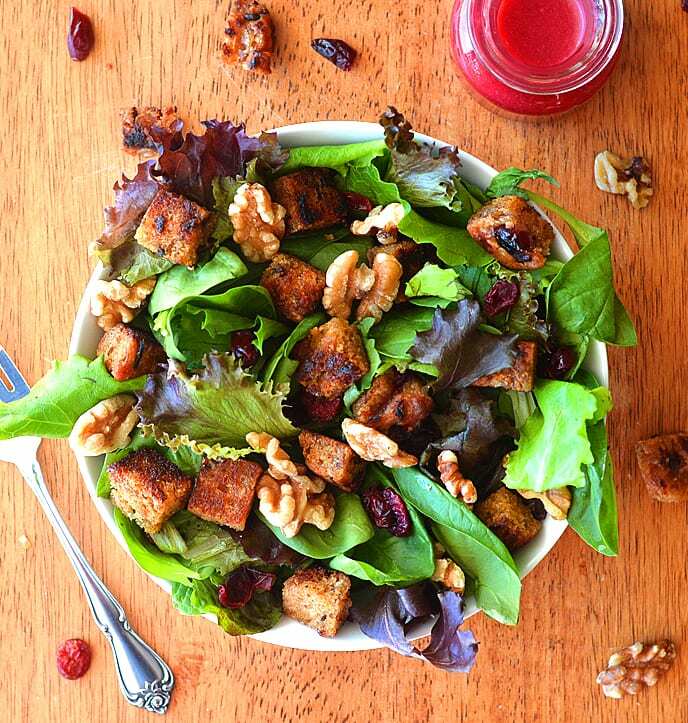 From the vinaigrette, to the croutons and the salad – cranberries are definitely the star of the show! In a saute pan with 1 tsp of oil, toss bread cubes on medium-high heat and saute until toasted and crispy. In a small sauce pan, add the cranberries, vinegar and agave over medium-high heat until the cranberries start to pop and soften slightly. This should take about 10 minutes. Set aside to cool slightly. Place the slightly cooled cranberry mixture into a blender or food processor. Add the remaining ingredients (except salt and pepper). Taste for seasoning. Adjust sweetness with more agave and season with salt and pepper. 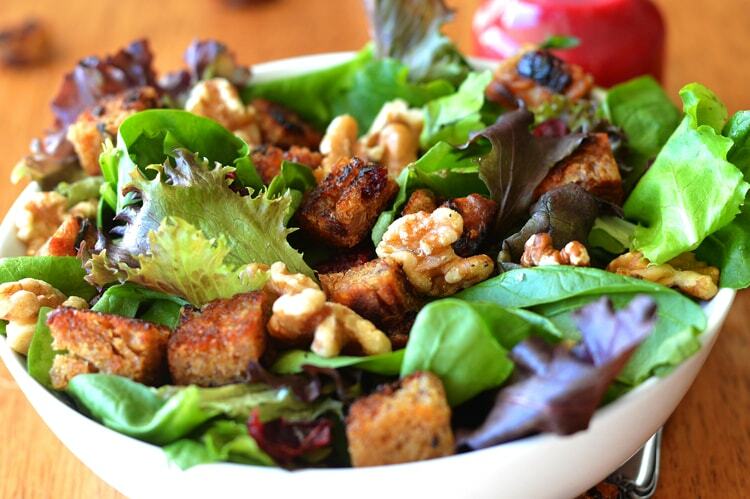 To tossed mixed greens, add toasted walnuts, dried cranberries and croutons. 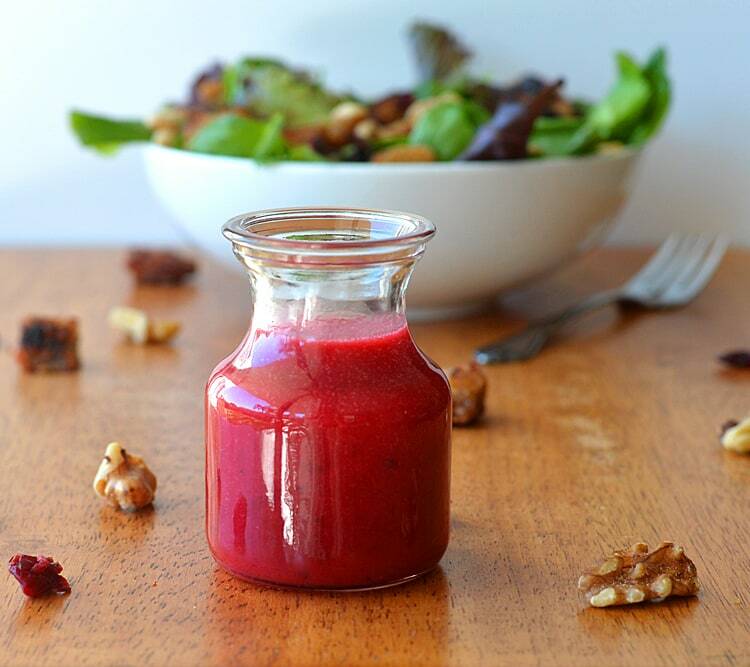 Serve with the Cranberry Orange Vinaigrette. This recipe makes about 3/4 C but easily doubles. Yum! You might just get me on a vinaigrette kick as well 🙂 This looks perfect. I’ll definitely give it a try and remember to put it on my Thanksgiving menu. Pinning now! I”m always unsure about what to do with fresh cranberries, as I usually just eat them dried. Never even thought about using them as dressing, what a fab idea!